Hi my name is Jo Cole. I come from near Bristol, UK. I Cosplay U.N.I.T. Brigadier Winifred Bambera from the 1989 episode Battlefield . I also have in the past Coplayed a headless monk and human hybred Dalek Sec. I for the main part cosplay with the Charity group Charity Sci-fi and Charity Dalek Squad. Hullo, would you like a jelly baby??? I'm Brian & I cosplay the 4th Dr. At this time I am around Tom's 5-6th season (Leela/Romana era). I am planning next year to also cosplay the late Roger Delgardo's Master, if I can find a suitable wig etc. My name is Simon though I like to be called Meds. I do a podcast called waffle on, am a huge Dr Who fan. Started watching in 1979 at the ripe old age of 6. Currently making my own mix of a fifth Dr and eleventh Dr costume. Sounds strange but i quite like unusual interpretations of costumes. Really enjoy seeing other peoples works, being creative is one of lifes gifts. Thanks great to be here. I see what you did there with the smiley face, may have to change back to my old avatar lol. w00t w00t!!! Yay for more peoples!!! Welcome welcome! 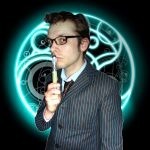 I'm Richard and I cosplay the Tenth Doctor, while my girlfriend Vicki cosplays Oswin Oswald from "Asylum of the Daleks". Hopefully some of you have visited my facebook page. Thankyou very much Mr Holden! Have been on holiday so have only just got around to joining - looks great!